So often I get e-mails from people who want something from me. But they do a really bad job of making me want what they want. The problem is not what these people are saying. It’s also not that I wouldn’t be interested in what they are asking. It’s how they are saying or asking for it. It’s such a common problem, but at the same time it’s so obvious and easy to fix. The effort put into manually e-mailing all these messages obviously means these people have a legitimate interest in growing their business. I’m not talking about pure spam. These are real people trying to write real messages to get attention from potential customers. If you want to send unsolicited e-mails to people, know that you can get so much more of a return on investment if you took the time to think about the receivers of your messages, instead of yourself and your own needs. For starters, just get to the point. Then learn a few tricks. They’re really easy, quick to find and free to read about, (because Google happened, and now we can learn anything we want on the Internet). Since there are already marvelous articles on the Internet that write about how to do e-mail marketing well, we’re not going to do that today. We are going to show you a few examples of poorly solicited e-mails, which we’ve probably all been guilty of writing before (yes, even me). Then I’m going to show you how they could be better (do throw your own tips in the comments too!). Before we start, it’s good to check out this post, which is one of the best breakdowns of a really great “cold e-mail” that was sent to Noah Kagan of AppSumo. Compare that with what we’ll find below, and you’ll get an even better sense of the lessons we’re trying to learn. Like most e-mails, this message is all about the sender, not the receiver. It is not considerate of the receiver’s desires or needs. It’s also not clear or coherent what this person wants. It switches topics in every paragraph. I don’t know you; why are you wishing me peace and prosperity? But ok, that’s nice. You want me to look at your blog, which is not even on a dedicated domain? I can tell you’re not a serious blogger. And what makes you think I have a moment to do this? (I’m skipping through paragraph 2). You want me to use your skills in my pursuits? Do you even know what I do for a living? What are you asking me? Do you want a job? Are you a freelancer? I thought you have a company already? Hi Joyce, I came across your LinkedIn profile and I see we have a few things in common. I thought it would be neat if we could work on some collaborative projects together. You could hire me, or I could hire you for some client work. If you’d like to connect further let me know. I’m really passionate about getting into this field and would love to chat. You seem like a really interesting person and I’d love to know how I could be of use to you. It shows that the sender actually checked out my profile and knows my interests. It gets to the point in the first paragraph (i.e. working on collaborative projects together, and hiring each other for real clients to do so). It asks for specific things (i.e. feedback on the blog, and how the sender can be of use to me, the receiver). It leaves the next step up to me, asking for a response if interested. This shows that the sender is not desperate. It compliments me (i.e. “you seem like a really interesting person”). No one can resist a compliment. There is no specificity in this e-mail. They don’t say what they do, other than they have a “customer and distributor base.” There is no way to spark interest in any topic because there are no details. Then it asks for free, ambiguous help in return for an ambiguous favor. But we still have no idea what this company is about or any incentive to exchange favors. You read my summary on LinkedIn? Really? And what did you learn? And how does that have anything to do with what you’re writing about? 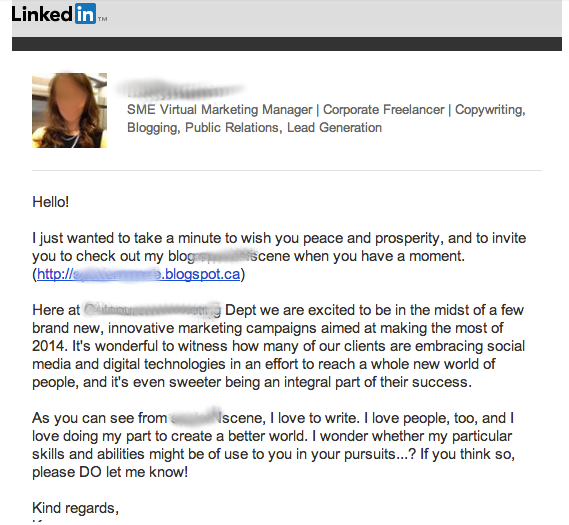 Are you trying to make me think you are part of something important by ‘name dropping’ a name I’ve never heard of, expecting me to recognize that person out of the 500+ connections I have on LinkedIn? Now you want me to help you expand your brand? Do you know how much work it takes to expand a brand?! Are you asking me for free help? If you want to hire me for my services why don’t you just say so? 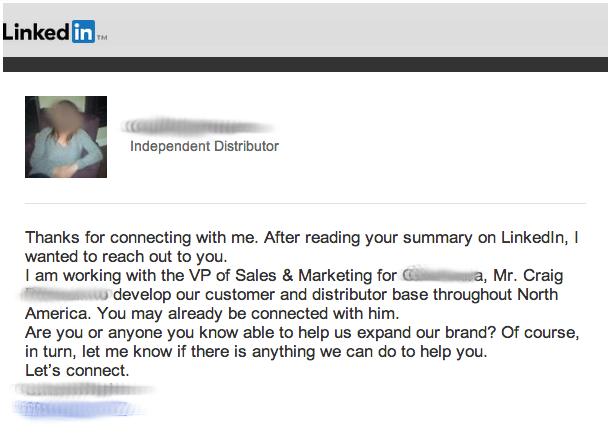 But you must not be because you’re trying to offer me a favor in return for expanding your brand? Do you have any idea what you’re talking about? What exactly do you want me to do to expand your brand? Is this some kind of ‘get rich quick’ scheme? If so, you’re hanging with the wrong crowd, and I ain’t joinin’ you. Hi Joyce! Thanks for connecting with me here on LinkedIn. I like how you said in your summary that you own a guitar you never learned to play – I’ve got a clarinet collecting dust too! The reason I’m writing is that I’m looking for a bit of guidance. I recently joined a company that does ____________ and specializes particularly in ______________. My role at the company is to learn how to expand the brand through online marketing. I see this is what you specialize in and I’d love to have a call to see how we could potentially work together. I see a lot of value in what you do, and I see you’re well trained. Perhaps we could set up some coaching sessions or get you to consult on our ____________. I’m happy to pay for your time. Let me know if you’d like to chat further. Thanks! It addresses a real person. It shows a specific detail that proves the sender read my summary on LinkedIn, and uses that to connect at a person-to-person level. It says what the sender wants. It describes the company in detail. It proves that the person behind the company is legitimate by providing specific facts about his accomplishments. It says specifically how I can help. It makes it clear the sender ‘means business’ and is not asking for favors from strangers. This e-mail goes on and on about the organization without getting to the point until the third paragraph. 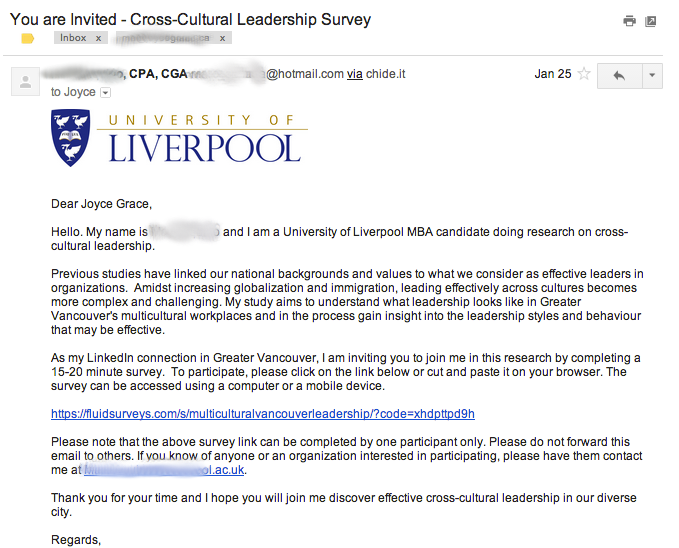 It also does not recognize my time as valuable and writes as if I’m expected or privileged to take the survey. It does not state any benefit that I could possibly get out of doing this task. Blah blah…oh you want me to take a survey? I’m “invited” to take your survey? What? Excuse you? Wow that’s a lot of instructions for a survey. Why are you telling me not to forward it to anyone….what? Why would I ever send this to anyone? I have a quick favor to ask you and it would mean a lot to me if you could help. I’m trying to finish up my master’s degree and I need to conduct a survey for one of my last projects so I can finally graduate (yay!). I know you must be a busy person, so I made this survey short. It should only take 15-20 minutes of your time, and the questions are really easy to answer, so some people do it even faster. If you have any questions about how your information will be used, just let me know. It addresses a real person in a friendly, human-to-human way. It is very honest and transparent. It gets to the point in the first paragraph. It recognizes the value of the receiver’s time and shows an effort has been made to minimize the time needed for the favor. It doesn’t give the extra detail that’s not necessary, but offers it if the receiver wants it. It makes it clear that this is a pure favor, but makes the gratitude for the favor extremely clear. Who cares?! Your boss maybe, but no one else. Don’t ever send out e-mails like this. Ever. How did you get my e-mail address? I’ve never met you before. Who are you? Did you seriously just style a huge headline saying your website is now live? Oh you do projects? Are you a marketing company? Oh wait, up in the corner it says engineering. Wait, what are you? Did you just use the word “exciting” to describe the “Services” page of your website? ROFL. People…..why would I care about your people? I don’t even know what you do! Who are you?!!! Why are you sending me an email about your engineering and manufacturing website? I’m a web freelancer that works in her pyjamas. In case you don’t remember me, we met at ______________ back in _____________. Sorry for the mass e-mail but we were hoping you could do us a favor. We just launched a new website and we’d love your feedback. We know that feedback is always important in these processes. We’re only one group of people who all work within our industry, so there are things you’ll see as an outsider that we will always miss. Would you mind taking a moment to check it out and let us know what you think? And hey, if you like it, feel free to share it with your friends! We’d appreciate the support! Even though it addresses a group of people, it is written from a “me” – one real person, not a company. It apologizes for the mass e-mail but explains right away why it was necessary (people can relate in times like this). It asks for a favor in a specific way instead of trying to ‘plug’ the company. (Actually the type of feedback to ask for could be more specific than in my example). The goal of getting people to view the new site is still accomplished, only now the company is making the receivers feel like part of the process of creating something amazing. The message is now relevant to the receiver. The e-mail asks people to give more support by sharing the site, but only if they want to. There are no graphics! This makes it seem less like an advertisement. This e-mail starts by making it sound like the sender has real clients and wants to give freelancers projects that are already lined up. But it’s not. 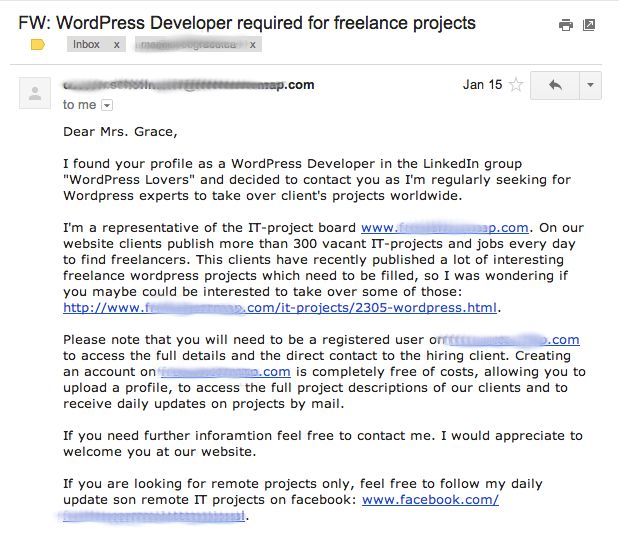 It’s a sleazy way of trying to get someone to sign up for one of those freelancer sites. There are also grammatical errors. But that wouldn’t be a big problem if the letter were more transparent and honest. You want me to take over your projects? Wait a minute…no you don’t. That’s such a lie! You just want me to register for your freelancer site. If you were really that great of a site you would not need to write unsolicited e-mails to people asking them to sign up for this. I saw your profile in the WordPress Lover’s group. I have a site that you might like to join, since it offers WordPress development projects. It’s a freelancer site but it has a twist. I believe that in comparison to all the other freelancer sites out there, this one is ______________ and does ___________ differently by offering ______________ to _____________. Feel free to check it out and let me know what you think! I always welcome feedback. And if you need help finding your first project or hiring someone on there, let me know. It gets to the point right away and mentions the benefit to me, the receiver. It explains what makes this service different than all the other similar services out there (since this is a common business model). It welcomes feedback, which encourages a response. It offers help specific to what I would need out of the site. This one is actually not that bad, except it’s missing a teaser, or point of interest. The benefit is also trivial and not worth taking time out of my day to click on the link (i.e. because I’ll find the case studies ‘edutaining’). This could do with more specifics on what there is to be learned. That’s nice, but I don’t really have time right now. I just put together a video compilation of 3 businesses that overcame sales challenges. One of them earned $__________ in just ____ weeks after using a little trick I taught them. The other two increased sales by _________% to _______% after firing their biggest customers. You might even know the business owners – they’re local Vancouverites and have been seen at events around town. I think you’ll like the lessons that they came out with, and might even get a chuckle or two to cheer up your day. It says what format the case studies are in, so I’d know what to expect (I made up the video part). It uses the word “overcame” to show that there is a story of struggle and victory in the content (everyone likes those because they are inspiring). It gives specifics on what there is to ‘get’ out of watching (i.e. how to earn $____ in ____ weeks by learning that mysterious “trick”). It gives an irresistible teaser of something I’d never expect in the story: these people increased sales by firing customers, and not just any customers, but their biggest customers. Ooooh, now I want to know. (I made that all up by the way). It mentions I’m going to get a lesson. This e-mail is long. It’s so long I can’t put a full image of it in this article, you know why? It would be 3300 pixels long. Do you know how long that is? Most websites don’t even have a width of half that size! While the content might be interesting to a select reader group, this company consciously chose to send out one huge newsletter a few times a year, instead of doing the obvious form of e-mail marketing: keeping subscribers engaged with frequent contact in smaller bursts. This newsletter needs to broken into smaller bits, with graphics removed, and the text written as from a human to a human, not from a corporation to a human. It also needs to re-think the way it is framing its content. What is the goal of keeping in touch with customers? And how is that being portrayed in the e-mail content? The AppSumo newsletter (I keep these newsletters in my inbox just because they’re so well written, not because I plan to buy every product they send me). Here is a sample. The Web Friendly newsletter (the contents of which you can also read here). Full disclosure: the owner of Web Friendly is my brother. I gain nothing by mentioning his newsletter to you here! The Bon Accord Creative newsletter (this is a drip campaign specially targeted to a niche group of wedding professionals). Here is a sample. Jaeny Baik’s newsletter (she sends tips on how to make videos effectively). Here is a sample tip. Start with something the reader wants – not what the company wants them to know. In other words a business owner would love it if everyone knew everything about their company. But realistically, no one cares. They just care about what benefits them directly.Let’s say you’re a plumber sending out a newsletter. As a consumer, I wouldn’t care so much about what’s happening at your company. But I DO care a lot about how to fix my plumbing problem, or how to prevent losing money because I paid attention to something I didn’t know was a problem. Give people a really valuable tip they can apply to their needs right away. End with a soft sales pitch and a good reason why they should buy the product or service they offer. These kinds of e-mails can be sent out almost every week rather successfully, without a lot of unsubscribes, because they contain value to the reader. 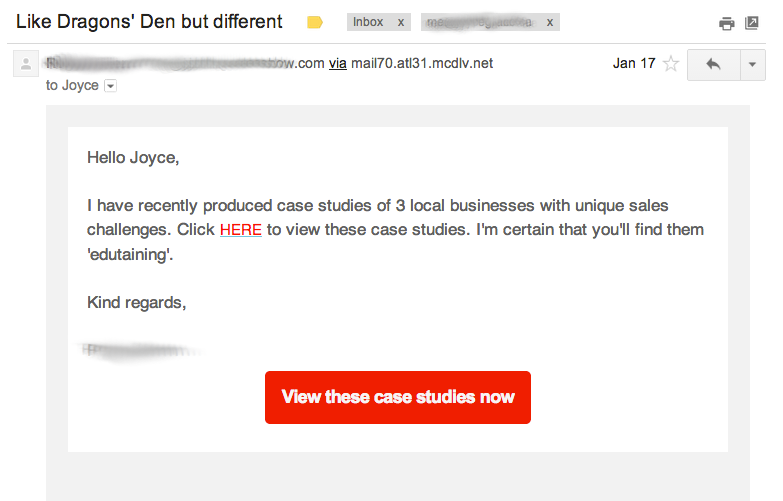 Other e-mail marketers don’t even include the pitch at all in their e-mails. They simply send out content from their blog in short, digestible summaries. For example, check out the Seth Godin newsletter or Neil Patel’s newsletter. When you land on Neil Patel’s site, QuickSprout, you get the sales pitch from his pop ups and sidebars. But first he gets you to the site with great content. With Seth Godin, you get to the blog and on the sidebar you see covers of his books. 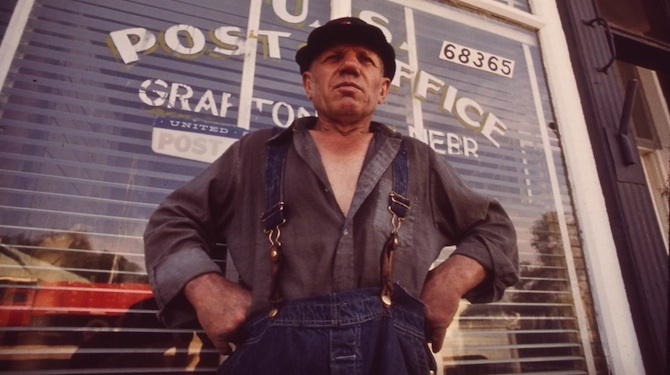 Not everyone is trying to master e-mail marketing as a ‘newsletter’ or ‘drip campaign’ system. However, even the order people put paragraphs into in an unsolicited e-mail could make a difference in the type of response they get. Next time you want to use unsolicited e-mail to try to get an advantage for your business, think about how it relates to your reader, and use the WIIFM principle. This stands for “What’s In It For Me” – your audience is always asking this question! I love your writing style, very considerate, human and it is amazing that people just don’t take the time to put themselves in the their prospects seat, and consider what is that that they would read and respond to. Bookmarking this page for future reference, and I know where to find a great writer for some future work. He wasn’t asking, he was “inviting” 🙂 It was a privilege you see.